Walter Palmer's dental practice resumes: Minnesota "Cecil" hunter back to work. 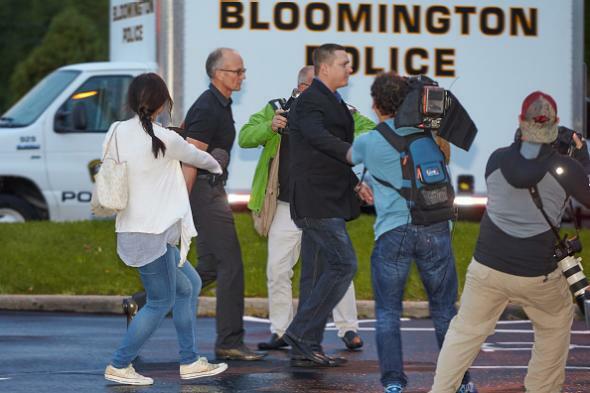 Dr. Walter Palmer (in black short sleeves) walks to work alongside security guards and members of the media on Tuesday in Bloomington, Minnesota. Palmer’s interview was the first he’s conducted since accounts of the lion’s death became a major story—a story fueled by images of the dentist with other big-game trophies and the news that he pleaded guilty in 2008 to lying to federal officials about the details of a black bear hunt in Wisconsin. He has not been charged with a crime related to the Zimbabwe lion hunt nor contacted by authorities, a lawyer acting as his adviser says. “I have a lot of staff members at River Bluff Dental. I’m a little heartbroken at the disruption in their lives, and I’m a health professional,” said the casually dressed Palmer, calm and all business, during the back and forth as attorney Joe Friedberg and a public relations consultant flanked him in what the dentist said would be his only media availability. Palmer previously said in a statement that he did not know that Cecil was a well-known animal (or that it was being tracked for research) until after the lion was dead. Palmer “reiterated” in his interview that he believes the hunt was conducted legally, the Star-Tribune says.